At noon today representatives of the Formentera Council and the local chamber of commerce handed out prizes for the twelfth Concurs d'Aparadorisme Nadalenc, or “Christmas Window Dressing Contest”. 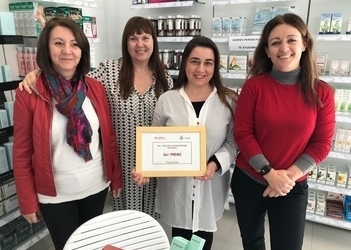 CiF trade councillor Alejandra Ferrer and chamber of commerce spokeswoman Lina Tur visited the winning establishments to deliver the honours. This year's winning contestants were Sant Ferran's Casa Ortega, which scored a €225 first prize and an honorary plaque, Sant Francesc's Papereria Tur Ferrer (a stationary store) came away with the €150 second prize and plaque, and Parafarmàcia Gomà Roca in Sant Francesc was honoured with the €75 third prize and plaque. The contest is put on jointly by the administration and chamber of commerce as a way to promote a festive holiday spirit across local businesses. This year roughly fourteen shops took part.